Pool wasn’t much of a mainstream sport back in 1961. It was viewed as little more than something men did to amuse themselves while drinking. But The Hustler changed that. With handsome Paul Newman and elegant Jackie Gleason knocking the balls around, suddenly the game was respectable. The movie—which was released 55 years ago today—was respectable too, earning nine Oscar nominations (including Best Picture and nods to all four main actors), though it only won for its cinematography and set decoration. (It was West Side Story’s year.) Let’s rack ‘em up and see if we can break down some of the film’s interesting backstory. 1. THE DIRECTOR HAD BEEN A POOL SHARK HIMSELF. Robert Rossen, born in 1908 to Russian-Jewish immigrants (his father was a rabbi), grew up in the tough ghettos of New York’s Lower East Side. As a youth, he had occasion to hustle pool, and even tried to write a play about it before stumbling across Walter Tevis’s novel The Hustler and deciding Tevis had done a better job. 2. JACKIE GLEASON DID HIS OWN TRICK SHOTS, THANK YOU VERY MUCH. The comedian, best known for playing working-class loudmouth Ralph Kramden on The Honeymooners (which he created), had grown up in Brooklyn. Like Rossen, Gleason mixed it up with neighborhood toughs and got to be a pretty good pool hustler. He required no assistance for his trick shots in the film, and Rossen always positioned the camera so we’d be able to see that for ourselves. 3. 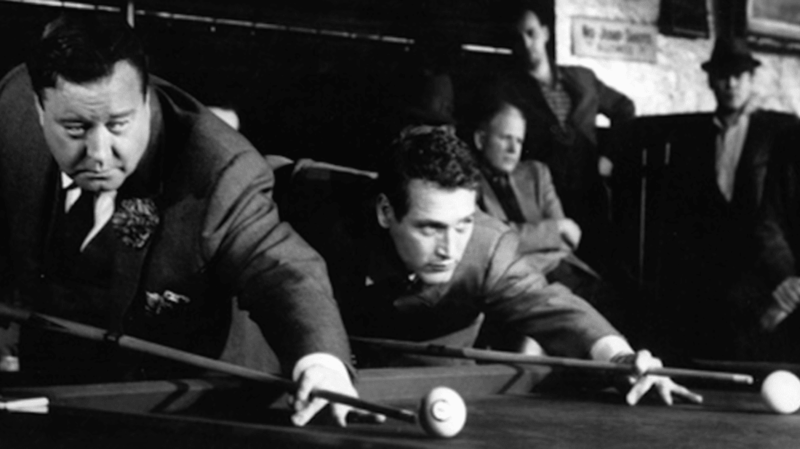 PAUL NEWMAN DID MOST OF HIS OWN SHOTS, TOO, DESPITE NEVER HAVING PLAYED POOL BEFORE. Newman’s story was different. Unlike his co-star and director, he hadn’t hustled pool as a youth, and in fact had never played the game at all before being cast as “Fast Eddie” Felson. Ever the Method actor, though, he installed a pool table in his apartment and practiced for hours a day in the weeks leading up to filming. He got good enough to perform most of his own trick shots. The ones he couldn’t do were executed by Willie Mosconi, an advisor on the film who was the most famous pool player in America at the time. 4. THERE WAS A REAL MINNESOTA FATS ... BUT ONLY BECAUSE A GUY STARTED CALLING HIMSELF THAT AFTER THE MOVIE. When the movie came out, Rudolf Wanderone was up there with Willie Mosconi as one of America’s best pool players. A hefty gentleman, Wanderone had several nicknames, including Double-Smart, New York Fats, and Chicago Fats. There was no Minnesota Fats; The Hustler novelist Walter Tevis had made the character up. But in a promotional interview for the movie, Mosconi said Wanderone had been Tevis’s inspiration (which Tevis denied for the rest of his life, adamantly and with great annoyance). Wanderone seized the opportunity, perhaps flattering himself into thinking Tevis really had had him in mind. He embraced the nickname and declared himself the real Minnesota Fats for the rest of his career. 5. PAUL NEWMAN STARRED IN IT BECAUSE OF CLEOPATRA. Originally, Newman couldn’t be in The Hustler because he was scheduled to make Two for the Seesaw with Elizabeth Taylor. But then Cleopatra went way over schedule (over budget too, though that’s not relevant here), and Taylor had to drop out of Seesaw. The film was totally recast (with Robert Mitchum and Shirley MacLaine), and Newman was freed up to make The Hustler. 6. IT HURT BOBBY DARIN’S FEELINGS. The popular singer had already been cast in the lead role when Newman became available. So quickly was Darin scuttled in favor of Newman that word got out before anyone had a chance to tell Darin. He had to hear about it secondhand, adding further insult to the ignominy of being replaced. 7. THE MOVIE ISN’T VERY LONG, BUT IT WAS WIDER THAN USUAL. The Hustler was shot in Cinemascope, the widescreen technique that had been in use since 1953. But it was mainly used for lavish epics and colorful musicals, not black-and-white dramas set in dingy pool halls. Yet as film critic Michael Wood pointed out, Rossen used Cinemascope “to create an oppressive, elongated world in which ceilings always seem terribly low; and people terribly separate from each other; in one shot Newman is even separated from his own image in a mirror by the whole width of a very wide screen. It is a world in which the pool table seems the one natural shape, while human beings seem untidy intruders.” Neat, huh? 8. THE STUDIO SUGGESTED CHANGING THE TITLE. “Hustler” was also a well-established (since 1924) slang term for a prostitute. One alternate title suggested was Stroke of Luck. When cooler heads prevailed and The Hustler remained The Hustler, “Stroke of Luck” was added to the Kentucky Derby scene as the name of one of the horses. 9. ROSSEN HAD TO GET SNEAKY TO GET THE STUDIO TO PROMOTE THE FILM. 20th Century Fox was hemorrhaging money because of Cleopatra, and they wanted The Hustler to be as profitable as possible (they’d already short-changed Rossen on some production costs). To that end, they told Rossen to trim some of the pool-playing scenes—including the one that opens the film—as they feared female audience members wouldn’t understand the game. In response, Rossen held a midnight screening for all the cast members of all the shows then playing on Broadway. Word-of-mouth from that prestigious group of thespians was so strong that Fox left the film intact and actually stepped up efforts to promote it. 10. GEORGE C. SCOTT TURNED DOWN HIS OSCAR NOMINATION. A little stung at having lost when he was nominated for Anatomy of a Murder, and generally disdainful of the whole award-giving enterprise, Scott sent the Academy a telegram declining his Best Supporting Actor nomination for The Hustler. The Academy declined his declination, and Scott remained a nominee. (He lost to George Chakiris from West Side Story.) A decade later, when Scott was not just nominated but actually won the Best Actor prize for Patton, he did not attend the ceremony and refused to accept the trophy. Hollywood learned its lesson: do not try to give George C. Scott things. 11. THE FAMOUS WHISPER BETWEEN BERT AND SARAH WAS NOTHING. 12. A LOT OF THE UNSAVORY TYPES HANGING AROUND THE POOL HALL WERE ACTUAL UNSAVORY TYPES. Always in the pursuit of realism, Rossen hired actual street thugs to use as extras. He even had them join the Screen Actors Guild so they’d be legit.